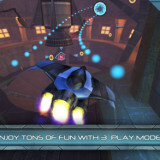 Fast paced and frantic action that will keep you coming back for more. Tons of frustration to be had, with crashes galore. 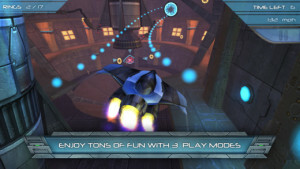 Qubic Games brings a fast paced and frantic solo racing experience with Air Race Speed. 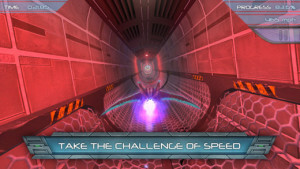 With action featuring jets hurtling through tunnels and obstacles at breakneck speed, it’s a gam that really keeps you on your toes – and fighting to finish. It’s one of those games that will keep you coming back for more – but will also make you want to throw your phone on more than one occasion. The basic premise of Air Race Speed is simple. You are the pilot, and you must navigate your ship through the course from beginning to end as quickly as possible – and with as few crashes as possible. It’s much easier said than done, though the controls are super simple to pick up. You can choose between two different control schemes – tilt or touch. With tilt controls, you simply tilt and turn your screen to pilot the plane. It’s so easy to do, even young kids can do it – but it’s also really easy to over correct, causing your sweet jet to go careening into the every present walls. When touch screen controls are selected, there is a touch button on the bottom left hand side of the screen that acts like a joystick to pilot your plane. It’s quite sensitive (and sensitivity can be adjusted to your liking via the options screen). Again, super easy to use, super hard to master. Whichever control scheme you choose, there will be a small button on the right hand side of the screen that activates your turbo function. This is essential to finishing tracks on time, as you’ll often ned that extra speed. But, when the course gets extra tricky, that boost of speed may just send you to your doom. The levels themselves are a combinations of extremely tricky tunnels – tight spaces, tons of obstacles, and curving walls – and open rooms. The tunnels are tough, and often have some really difficult configurations to wind your way through, but the rooms can be just as difficult. For one thing, it isn’t always easy to tell which way you’re meant to go, and maneuvering your way around corners and back down into tiny tunnels takes a lot of skill. On top of that, whether you’re in a tunnel or winding your way through a room, dead ends an unexpected obstacles could be around any corner. Air Race Speed is one of those games where how well you perform depends entirely on your skill. There’s no blind luck at play – simply pure skill and a whole lot of practice are all that is needed if you want to fight your way through all 36 levels. 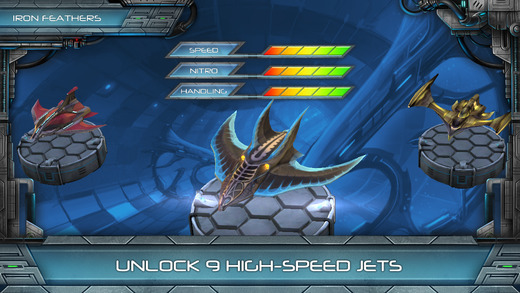 With variety in how you play, nine different jets to unlock, and the coveted high score to attain, Air Race Speed is a game that will keep you coming back for more – if it doesn’t make you break your phone first.